Have you tried real barbecue? Summer is here and that means it is time to barbecue! Today, the word "barbecue" (It can also be spelled barbeque or BBQ.) means a food party or cooking outside or simply cooking meat over a fire. But do you know what is a real barbecue? Food that is cooked over a fire is called grilling. With fire, the heat is high and the outside of the meat cooks very quickly. When grilling, it is better to use a tender meat. Tender meat is softer and easier to eat, but it is also more expensive and usually has more fat. A special part of barbecue is adding flavor to the meat. There are many different barbecue styles and flavors. Some are sweet and some are spicy. Some places use vinegar-based sauce and some use tomato-based sauce. Some places don't use sauces at all. 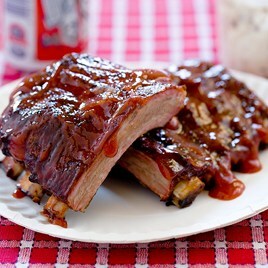 Sauce - The three different bases for barbecue sauce are mustard, tomato and vinegar. The sauce is usually added just before serving or just for dipping. But some places baste the meat with sauce while cooking. Smoke - A popular element of cooking barbecue is the smoke flavor. Wood chips, commonly hickory or mesquite, are added to the hot coals to make a flavorful smoke that is absorbed by the meat. Spice rub - Spices, seasonings and herbs are rubbed into the meat before it is slow cooked. Some ingredients are black pepper, salt, chili powder, paprika, garlic powder, basil and so on. American barbecue originated in the southern states. Each region has its own brand of barbecue flavor. With so many styles, which one is the best? Now there are many barbecue festivals around America. Barbecue experts bring their cookers and secret recipes to compete in barbecue cook-offs. These contests are fun for barbecue fans because they can try many different kinds of barbecue in one place. You can barbecue easily in your backyard. You just need a cooker, preferably one with a cover. Just remember to use low heat and slow cooking. There are many recipes on the Internet. But you will need to practice to get just the right temperature and cooking time for delicious barbecue meats. If you would like to try real American style barbecue in Japan, I recommend Bashamichi Taproom in Yokohama. The baby back ribs at Tony Roma's are pretty good too. How long do you need to barbecue meat? What kind of wood is used for smoke flavor? What are some of the ingredients used in a spice rub?